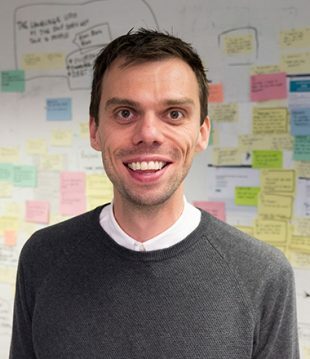 I’m Ryan Thomas Hewitt, Lead Business Analyst in DWP Digital. Melanie Cannon, Lead Content Designer, recently wrote about how we’re helping teams define their focus. One of the things we look to define is the long term goals, or a mission statement for the products and services we’re working on. In this blog I’ll discuss how to identify key metrics from a mission statement. A mission statement is a broad, aspirational statement about the long-term goal of the service. Be the simplest, fastest way for people with a disability or health condition to get the practical help and support they need to stay in work and live independently. Most mission statements contain a number of keywords, like ‘simplest’, ‘fastest’, ‘best’ and ‘cost-effective’. 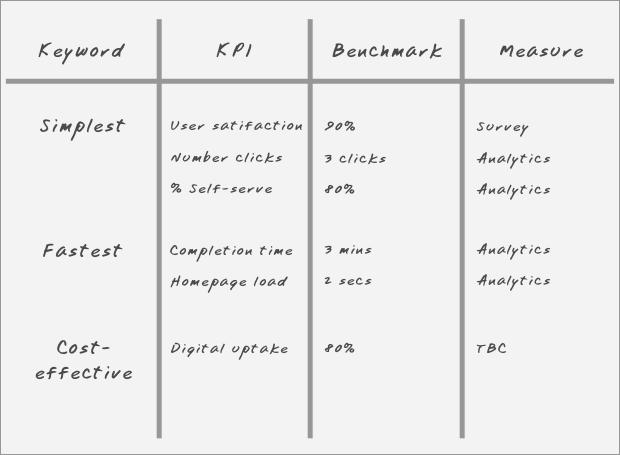 We can use these words to identify key metrics. We put the mission statement on a wall. The team then highlight any keywords. We discuss how to make each keyword measurable. And for a service to be the ‘fastest’ we need to compare it to alternatives. Is 2 minutes fast enough, or 5 minutes, or 30 minutes? What will make it the fastest? The keywords here are 'simplest', 'fastest' and 'most cost-effective'. We then need to work out how to make each keyword measurable, decide which the most important ones are and work out how to track them. For example, ‘simplest’ might mean we aim to achieve a user satisfaction rate of 90% or that the average number of transactions can be completed in three clicks. User satisfaction might be tracked using a survey within the product, or sent out to users, while number of clicks could be tracked using Google Analytics. 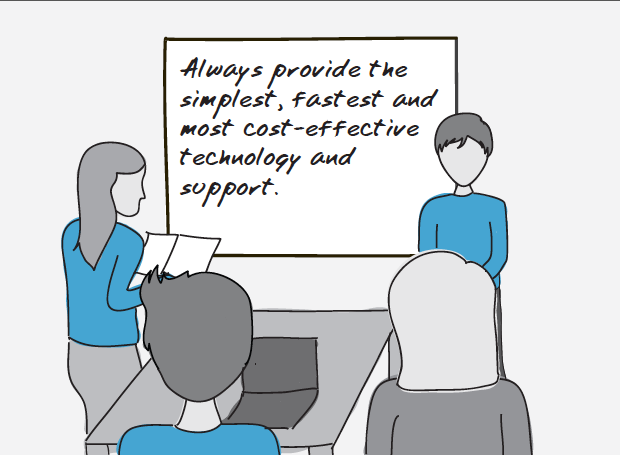 'Fastest' might mean it takes a day to resolve a support request, which could be measured using information from the technology support team. 'Most cost-effective' might look to benchmark the cost of individual transaction. This could be measured by dividing the total cost of the service by the number of transactions. The exercise may lead to the mission statement being reworked. The discussions the team has may raise assumptions that we hadn’t considered before. Mission statements are a great way to identify the key metrics for project success. Having key metrics directly aligned to the mission statement focuses a team. It means the team has clear targets and knows what success looks like. Typically a team will have three or four key metrics. This doesn’t mean other metrics will be ignored. And of course key metrics can change based on feedback. Metrics and mission statements complement each other. Missions give us a meaningful direction, metrics provide a measure of progress.